Baby Point BIA Successful Charity Soup Festival Proudly Supports Children this Holiday Season! - Baby Point Gates B.I.A. Baby Point BIA Successful Charity Soup Festival Proudly Supports Children this Holiday Season! Home > Uncategorised > Baby Point BIA Successful Charity Soup Festival Proudly Supports Children this Holiday Season! The Baby Point Gates BIA is pleased to announce, that their 5th Annual Baby it’s Cold Outside Holiday Open House and Charity Soup Festival, was a tremendous success in raising money for the Toronto Star Santa Claus Fund. The Charity Soup Festival – a new event this year – raised $1,740. All proceeds go to distributing holiday gifts to children from families with limited means. During a very cold and rainy Saturday, November 19, a whopping 870 cups of soup were served! For a suggested $2 donation, shoppers sampled a wide variety of delicious soup offered by the many generous merchants in the Baby Point Gates culinary corridor. The BIA is centered at the corner of Jane and Annette Streets, just a five minute walk north of Bloor Street West in Toronto’s west end. A formal cheque presentation will occur at 6pm on Wednesday, December, 7th, 2016 in front of the Mad Mexican restaurant located at 409 Jane St. The BIA board members, as well as Mad Mexican restaurant owner Jose Hadad, will be on hand to present a cheque to Barb Mrozek, the Director of the Toronto Star Charities & Philanthropy. Mad Mexican raised the highest amount of money with their signature Sopa de Tortilla soup. 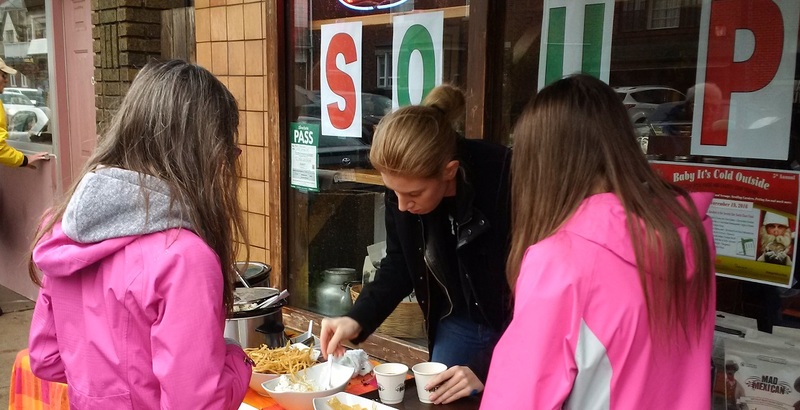 “We live and work in a wonderful, heritage district neighborhood so the Charity Soup Festival was a terrific way to give back to the community and support those in need”, states Lena Burek, Baby Point Gates Marketing Volunteer. The Baby Point Gates BIA looks forward to repeating this event again next year!